Combine strawberries, rhubarb, water, orange juice, sugar and vanilla bean in a heavy, medium saucepan. Bring to a boil over medium heat, stirring to dissolve the sugar. Reduce heat, cover and simmer until fruit is very soft, about 10 minutes. Put mixture in a bowl and refrigerate until cold, about 4 hours. Mix yogurt and vanilla until well-combined. Taste and, if desired, stir in superfine sugar. Chill until serving time. 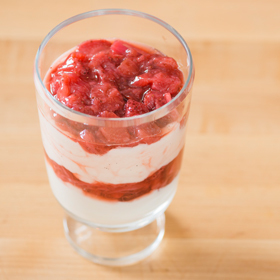 To serve, layer yogurt mixture and strawberry-rhubarb mixture alternately into parfait glasses, ending with fruit. Parfaits can be prepared a few hours ahead and refrigerated. Serving size: 1/4 recipe. Amount per serving: 131 calories, less than 1g total fat (0g saturated fat), 30g carbohydrates, 5g protein, 3g dietary fiber, 54mg sodium.